This Evergreen USB adaptor is for people who like to play with slots - of the flash memory kind. It's a USB memory stick with a slot for memory cards, so it's more like an adaptor, really. They have all sorts of models, ones which accept anything from Compact Flash, Secure Digital, micro SD, MMC and Memory Stick. The Compact Flash model goes up to 8 GB, measures 78 x 10 x 23mm. The SD/MMC model can do 2GB, measures 46 x 10 x 20mm. 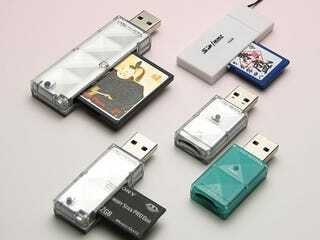 The Memory Stick PRO/duo model also goes up to 2GB and measures 55 x 10 x 18mm. All of them weigh 15 grams, apart from the micro SD, (also available in green) which comes in at a titchy 7 grams, and measures 46 x 10 x 20. Cost is around 499 yen, which is $4.15. P.S. I so wanted to headline this "Cartman's USB Stick is a Dirty Slot, but Mummy said no.